Daily Illuminator: Have An SJ Games Halloween Game Night! October 31, 2017: Have An SJ Games Halloween Game Night! Happy Halloween, everyone! October is one of my favorite gaming times of the year, and it's awesome working for a company that obviously feels the same way! We've got an entire lineup of games ready for fun with the ghouls this evening! Prep the goblins for trick-or-treating with a round of Ghosts Love Candy! Everyone loves candy, but ghosts love it even more . . . enough to scare kids for it. So why not be the one doing the scaring? Use your ghosts to get the candy, but don't scare the kids too much, or they'll run off. And where's the fun in that? Maybe you're into sugar skulls and the lore of Dia de los Muertos? Then the Muertoons are here to help! They'll lead you to the Dia de los Muertos festival, avoiding the tricks of the grumpy Tio Rico. This is a brand new release based on the Muertoons cartoon, itself based on children's books about the characters. If zombies are more your style, we have a whole legion of undead games perfect for a few (or even a dozen) players! Zombie Dice is one of our biggest hits, and our new Zombie Dice Horde Edition includes not only Zombie Dice 2 and 3, but also a unique dice bag! 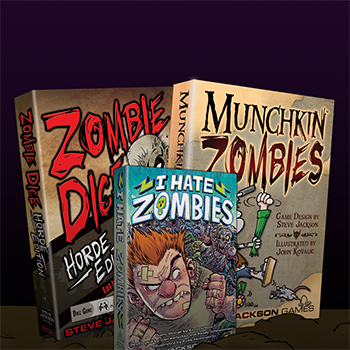 For a swarm of self-hating undead, you can bust out I Hate Zombies, by Kevin Wilson (you know, one of the designers of the Munchkin Collectible Card Game). This one plays up to 12 people; even more if you are at a convention and make some slight modifications, like we did. Pit humans against a shambling swarm in a party game of rock-paper-scissors . . . to the (un)death! Finally, of course, our tried and true Munchkin Zombies is always around to give you some brain-eating, backstabbing fun. No matter what flavor of fright you're into, we've got the game for you this Halloween! Swing by your haunted local game store and pick up these treats today! And don't forget about our Halloween Goodie Giveaway on Warehouse 23, where you can get some bonus swag with your orders. It ends tonight!